Growing up in Hanoi’s Old Quarter precinct, Thu Nguyen has always been inspired by food. After moving to Melbourne and practising as a chartered accountant, she realised that her love of food attracted her more than numbers – and thus Hanoi Rose was born. Located in the heart of Brunswick, Hanoi Rose serves up a mouthwatering menu that transports you to North Vietnam. As part of the launch of the new restaurant, the client wanted a professional and modern website that also be a visually impactful showcase of Thu’s culinary creations. 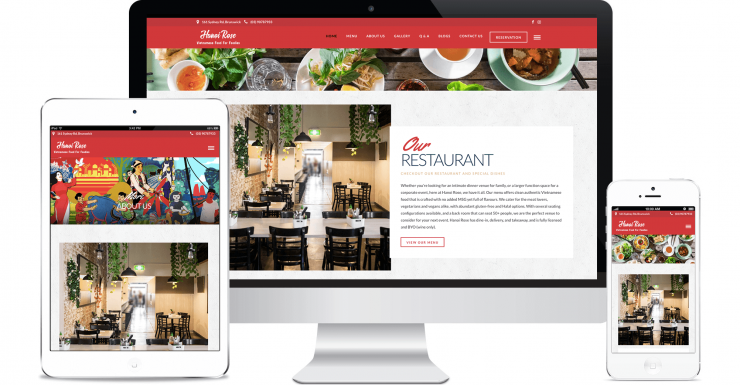 The final product ties together the restaurant’s stylish, rustic design as well as a spread of irresistible Vietnamese dishes to create a website that is distinctly Hanoi Rose. As an added functionality, the website also allows users to fill in their details to make a reservation with a click. At the conclusion of the project, the WDM team provided complete training and documentation so that the client is armed with the necessary knowledge to self-manage their website. All in all, the Hanoi Rose team was a joy to work with, and with their joint 10 minutes away from our office, we also couldn’t pass up the chance to visit for lunch (we loved their pho).